Proverbs 31:30. Charm is Deceitful Beauty is Vain Bible Verse. Personalized Custom Name Journal Book. Christian Gift for Mom Women Wife Her. The perfect PERSONALIZED "Charm Is Deceptive And Beauty Is Vain But A Woman Who Fears The Lord Is To Be Praised" from Proverbs 31:30 Blank Journal Notebook! Customize the cover with your name. Simply leave a note at check out with the name you would like on your journal cover. If you’re looking to for the perfect Proverbs 31 inspirational gift for any occasion, look no further. 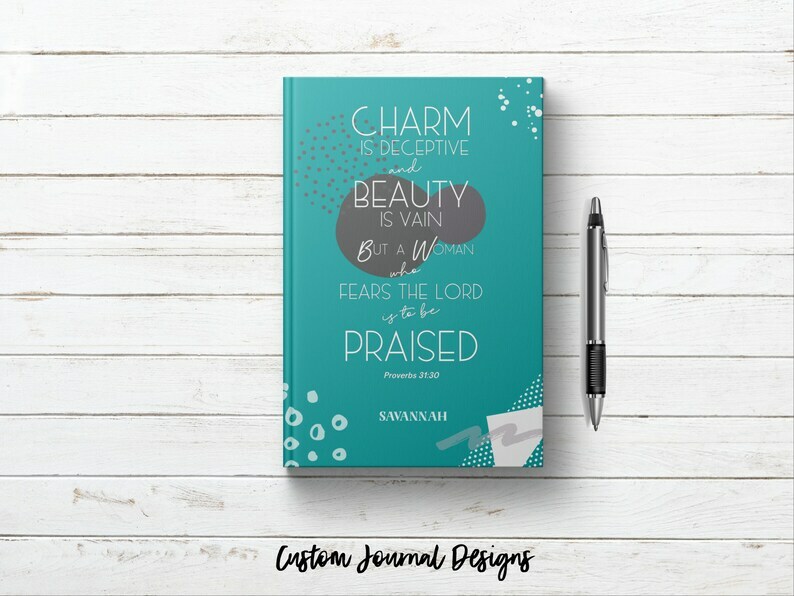 This blank lined notebook features the words "Charm Is Deceptive And Beauty Is Vain But A Woman Who Fears The Lord Is To Be Praised" from Proverbs 31:30 on the beautifully designed cover and offers plenty of room to write special notes, personal thoughts, or creative ideas. Each lined page has the motivational Scripture verse at the top to inspire you to remember that our true value comes from our relationship with God. The Proverbs 31:30 Bible Scripture Verse offers encouragement and inspiration for anyone and makes the perfect Christian gift idea for her Birthday, Christmas Gifts, Mother's Day, Friendship Gifts, or just about any occasion. • Choose from Lined, Dot Grid, Checklist, or Blank pages in the interior. • Size: 6" x 9"
You may choose to have this journal with or without a personalized name on the front cover. Every journal is made to order and our production time is 3 to 6 BUSINESS DAYS. However, we do try to ship earlier whenever possible. Processing times can be longer during the holidays. Orders are processed as they come in. We do not offer rush printing. ESTIMATED DELIVERY TIME ONCE YOUR ORDER HAS SHIPPED: 3 to 7 days. Optional Expedited Shipping is available at checkout. Journal to my Future Wife. Personalized Custom Name Journal Book. Girlfriend Fiance Engagement Bridal Shower Gift. Getting Engaged Notebook. You Are The Best Wife Personalized Custom Name Journal Book. Birthday Anniversary Romantic Gift for Her. Love Letters from Husband Notebook. Velveteen Rabbit Being Real Quote. What is REAL Personalized Custom Name Blank Writing Journal. Gift for Girls Women Friends Sister Writers. Customized Journal. Custom Journal Book. Personalized Journal Notebook. Writing Journal. Custom Name. Lined. Dot Grid. Blank. Hardcover. Bought this as a gift for my friend who started her own surf shop. She loved it !! It came quickly and looked great. Letters to My Son Personalized Custom Name Blank Journal Book. Writing Journal. Lined. Dot Grid. Blank. Hardcover Notebook Write in. Love this book! I am giving this to my future husband on our wedding day! I am writing a letter for 30 days leading up to the wedding. I highly recommend giving this as a wedding day gift! Will My Order Arrive by the Holidays? We are no longer able to guarantee delivery by Christmas 2018. Please send convo message for specific inquiries. I Love You to the Moon and Back Quote Personalized Custom Name Journal Book. Just Engaged Proposal Keepsake Gift for Her. Romantic Notebook. Before I Formed You I Knew You. Jeremiah 1:5 Bible Verse Scripture Quote. Personalized Custom Name. Christian Gift Pastor Appreciation Day.